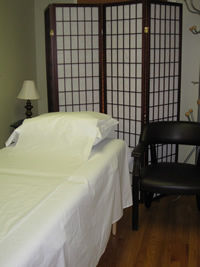 Acupuncture aims to restore and maintain health through the stimulation of specific points on the surface of the body. It involves the application of (1) needles to the body (traditional acupuncture); (2) needles to the ear (auricular acupuncture); (3) electric current (electro-acupuncture); (4) heat (moxibustion and heating lamp); (5) pressure (acupressure); and/or (6) suction (cupping). (Note that the point of application is not necessarily the area of the body where the patient is experiencing pain.) All of these treatment options are available at AOMTC, their suitability to be determined on a case-by-case basis. Each treatment option may carry its own fee. (See, "Office Policies"). A procedure in which tiny needles are inserted into various parts of the outer ear. 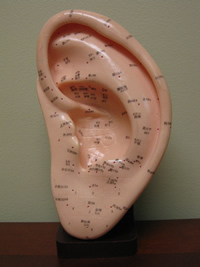 It is based on the Traditional Chinese Medicine principle that all areas and organs of the body are represented by corresponding acupoints on the human ear. It is often done in conjunction with traditional acupuncture, or may be used alone -- for example, to treat nicotine addiction. 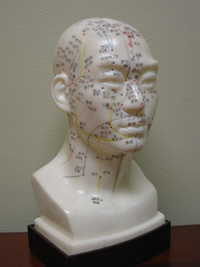 A procedure in which pulses of weak electrical current are sent through acupuncture needles into acupoints on the skin to stimulate qi (energy) and blood circulation, thereby nourishing the body and unblocking obstructions to qi flow in the meridians (the channels along which acupoints are aligned). A type of heat therapy in which an herb is burned above the body to warm a meridian at an acupoint and increase the flow of blood and qi. The herb may be placed directly on the skin, held close to the skin for several minutes, or placed on the tip of an acupuncture needle. Heating lamp treatment is provided at AOMTC in conjunction with one or more other forms of treatment, most often with traditional acupuncture or electro-acupuncture. Again, the purpose is to promote qi flow. A type of therapy in which the practitioner's fingers are used to apply direct pressure to one or more acupoints. We will teach you, in appropriate cases, where the relevant acupoints are so that you may perform this treatment on yourself at home. A procedure in which a rounded glass cup is warmed and placed upside down over an area of the body, making a vacuum that holds the cup to the skin. The resulting suction significantly increases the flow of blood and qi in the area. Cupping also opens the skin's pores and allows toxins to leave the body. Also called "Seven-Star Needle Treatment," this procedure involves the use of a seven-pronged instrument that is tapped against the skin for the purpose of microscopically breaking the skin surface to release toxins and relieve pain. This procedure is sometimes used in conjunction with cupping to promote slight bleeding in areas where the blood has stagnated (e.g., bruised areas). Thousand years ago the Chinese began to identify a number of plants, minerals and animal products that demonstrated medicinal or therapeutic properties. Collectively, this body of knowledge, along with acupuncture, forms the core of Traditional Chinese Medicine and is known as Chinese Herbology. For the most part, the substances employed in this effort to promote or maintain health are derived from plants or plant parts (known as "botanicals"). Botanicals are sold in many forms: as fresh or dried products; as liquid or solid extracts; and as capsules, powders, tablets and tea bags. 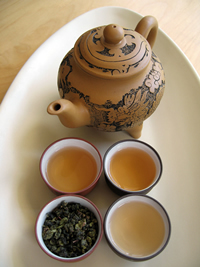 Botanicals that are not taken in tablet or capsule form are generally taken as teas or decoctions (roots, barks, or berries that require longer cooking in boiling water than teas). 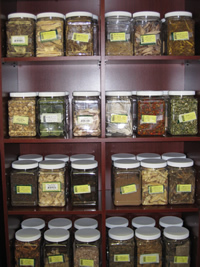 A full range of Chinese herbological products are available at AOMTC. These are provided in tablet, capsule and tablet form. For patients who wish to take these products in tea or decoction form, we will assist you in obtaining the product in fresh or dried form and preparing it for drinking. We ask our patients who do not wish to ingest animal products to let us know so that we may avoid prescribing for them those few products that contain ground cartilage or bone.